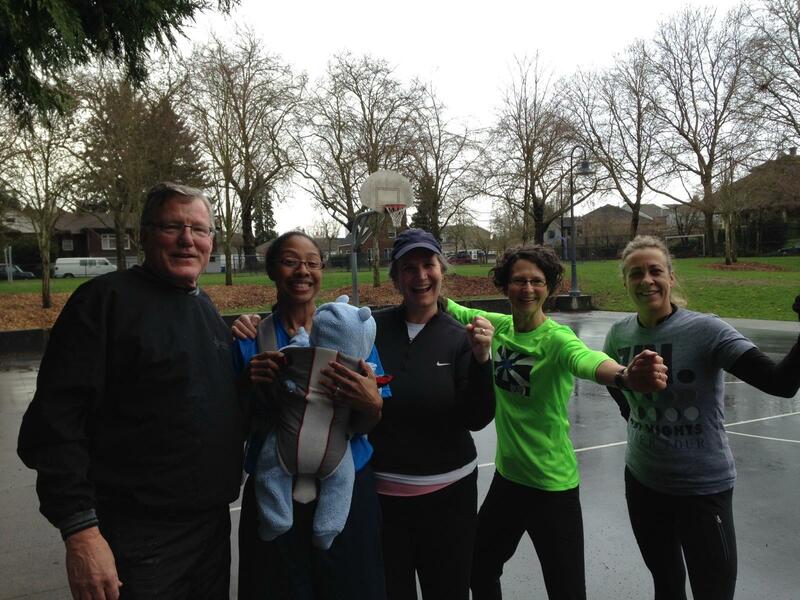 Madrona 9:45ers ain’t afraida no rain! This week I’ve been taking my classes back outside after being in a warm and dry dance studio since November. It’s a welcome transition, but it takes a little fortitude. When we go inside to Velocity Dance Center in the late Fall, I welcome the change. It’s 64 degrees, the wood floors are glowing golden brown. Light bounces off the mirrors. I get to trot out my new Spotify playlists and use their nice sound system. There are all kinds of props and features to design workouts around: ballet barres, platforms, chairs, over-stuffed cushions. And during that time, the weather and darkness take a backseat. Whatever is going on beyond the studio, we have a feeling of safety and detachment. “Sheesh! Glad we’re not outside today!” And after several years of doing this, I realize that even the very hearty folks who take my classes have better attendance if extreme weather is left out of the equation. But after 3-4 months in our cocoon, as dawn is beginning to move into the 6-7am window, I am drawn back outside. Okay, on the level, I am partly motivated by the desire to stop paying rent, but that’s secondary! Being outside, even in the elements is a key part of my animating principle. (Yes, I have an animating principle!) Even when it’s in the rain and wind, I feel alive exercising outside. That doesn’t mean that we don’t sometimes opt for a semi-protected location like we did once this week. We still feel the moisture and air on our faces. We smell the trees budding out. We’re surrounded by chirping. We say hello to people walking by. And I’ve come to believe that those are big ingredients to feeling alive. When we shout our see yas, shake the rain away and head off to our drier work days, Life is going right. 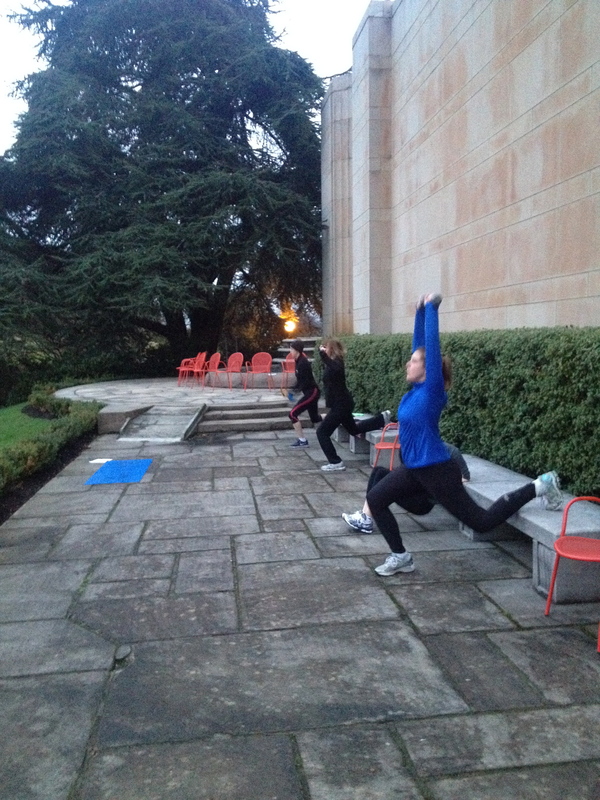 The 6am Volunteer Park Class has a great view for their split squats.